One item that most preppers are planning to include as at least one part of their SHTF planning is a generator whether whole house or portable. But even though generators are a critical resource in a power outage or a SHTF situation, most generators can be pretty noisy. Even if your nearest neighbors are understanding of the need for the noise in a temporary situation, you don’t really want to advertise in a post-SHTF situation that you have still have power. The noise of a generator can be heard for quite a distance because sound carries. So, having a noisy generator during a SHTF situation basically lets anyone in the vicinity know that your house has power and likely supplies that they need to survive. Not to mention when just about everyone else around you has no power, the noise from your generator and other appliances will seem deafening in the otherwise silent neighborhood. It will be hard enough to fend off looters and other desperate people who happen upon your home, you don’t want to do anything to make yourself a target. 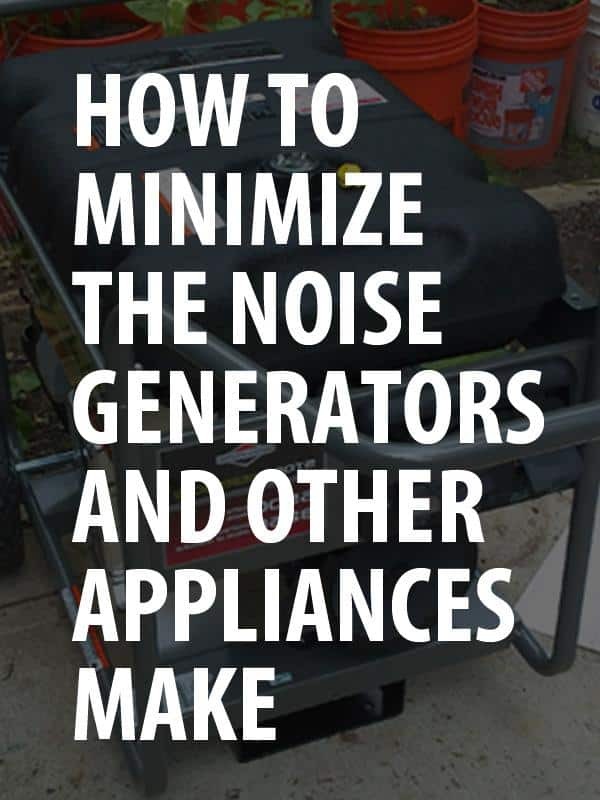 So here’s how to minimize the noise generators and other appliances make so that you can be less of a target in a SHTF situation. The first thing to consider in figuring out how to minimize the noise generators and other appliances make is to start off as quiet as possible. This means when choosing a generator, you need to do your research and choose a quality generator that is designed to be quiet, rather than trying to save money on an inexpensive, cheaper model. Generators come in different types and have different decibel levels which will impact the amount of noise they produce when running. The amount of load you run on an inverter generator at any given time can also impact how noisy it is. When it comes preparing for a SHTF event, you want to choose a generator that will be enough to cover the critical power needs of your home without being so much power and noise that you attract every looter within earshot to your home. Inverter generators are typically quieter and much smaller than standard generators but are typically designed to charge your cell phone, laptop, etc. rather than running several circuits in your home. Inverter generators are around 50 to 60 dBA similar to a vacuum cleaner whereas standard generators are 65 to 75 dBA or higher and sound more like a chainsaw or lawn mower. So, when buying a generator, go for a high-quality generator with the power you need that has the lowest decibel rating you can find. So, we know that buying the right generator to begin with is an important step but what if you’ve already bought a generator and discovered that it’s just too loud? Or what if you inherited one that you’d like to use if only it were quieter? To minimize the noise generators and other appliances make you can either reflect or absorb the sound coming out of the generator. Not all the noise made by a generator comes from the muffler. So just swapping the muffler isn’t going to solve all the noise problems. Using absorption and reflection techniques, there are several different methods you can use to minimize the noise generators and other appliances make. We’ve listed some of these below. When it comes to enclosing your generator, any hard surfaces will reflect sound waves and limit noise to some extent. Many people use cinder block which doesn’t require sealing. If you’re doing a three-side wall, it should extend about a foot above your generator and you’ll want to leave at least six inches between the cinder block wall and the generator. Anything you can do to muffle the vibration and noise of your generator can help to minimize the noise and keep you from becoming a target for those in the area looking for supplies. If you’ve built a casing for your portable generator, you can add padding to the inside of the casing to help minimize absorb sound. Quiet board or other sound absorption materials can be bought at any home improvement store and used on the interior walls of your casing. One quick fix that you can do to minimize the noise generators make is to swap the included screws for longer ones and add extra rubber washers. The frame should be sandwiched between rubber. The rubber absorbs some of the sound and will help to make your generator quieter. Many people have had luck in replacing the original muffler on their generator with an automotive muffler to make it run a little bit quieter. As you see in the video below this gentleman modified his generator and was able to reduce the decibel level from 94 dBA down to about 85 dBA. By itself the muffler modification would not be enough to prevent his home from becoming a target. Now, he started with a generator that was pretty high in decibels so if you are able to start with a generator that was only around 50-60 decibels to being with, it would be even quieter. Using a flexible heat safe pipe to extend your generator exhaust straight up into the air instead of horizontal can sometimes help to diffuse the sound or at least make it more difficult for those nearby to determine the exact location of the sound. Honda EU Series including the EU7000iS at about 52-60 dB(A) and the Honda EU2000i are designed to be quiet. One reason these are quieter is the Eco-Throttle feature which adjusts the speed of the engine to the load on it at any given time. They also include a dual tier noise dampening system. The Yamaha EF Series including the EF1000iS rated at 47-57 dBA and the EF2000iS which falls between 64-67 dBA are on the quieter side. For appliances such as air conditioners, even the powerful Yamaha EF6300iSDE is rated at just 58-64 dBA. Subaru 3200 and Subaru 4300 are quietest and more durable. Priced between $2,000-$3,500. When it comes to minimizing the noise that appliances make, you’re going to use some of the same sound dampening methods, either reflection or absorption. You can usually open up the casing of your appliances and attach your choice of absorbent material to the inside of the casing or housing. Keep in mind that appliance motors can get hot and sometimes the extra space inside the casing or housing is needed for proper air circulation and cooling. For refrigerators, adding absorbent material to the inside is not recommended, but you can create and soundproof an alcove around the appliance to minimize noise. To minimize the noise a washer/dryer makes, use vibration pads or other absorbent material beneath the appliance feet. You can also run the absorbent material under the machine and up the back wall to further minimize noise. Always follow manufacturer’s instructions regarding absorbent materials to any appliance. Whenever possible, replace the manufacturer’s batting or foam with more absorbent and fire-resistant material of the same size and thickness to avoid any potential interference with the normal operation of the appliance. In addition, it’s best to use a decibel meter to measure the results of your efforts. Appliances or a generator that seem quiet when everyone else in the neighborhood has power may actually be much louder when most or all of your neighbors are without power. The amount of effort you put into minimizing the noise generators and other appliances make will depend of course on whether you want to reduce the noise for your own convenience or whether you are attempting to keep things quiet during or following a SHTF event. Soundproofing generators and other appliances can take a bit of trial and effort to get the end result you want. If you are interested in soundproofing your generator and appliances to prevent becoming a target during a SHTF event or other crisis, you’ll want to make the modifications and be confident in the results before you need to rely on them to keep you hidden. Use your dryer hose, run the exhaust into a five gallon bucket of water, viola, no noise. Unfortunately, many of the cheaper generators make more mechanical noises than the exhaust does. don’t discount using temporary sound absorbing methods like salvaged mattresses to prop around the generator or line the interior of your garage – piping the exhaust up thru the roof is also a sound dampening advantage ….